India can be the world leader in drone technology and application, says Jayant Sinha, Minister of State for Civil Aviation. Addressing the 4th National Leadership Conclave organized by All India Management Association, he said that the technologies use in drones are similar to those used in electric vehicles and, therefore, as India progresses in electric vehicles, the country will progress in drones also. “Passenger drones can operate at the price points of auto-rickshaws and India can move from auto-rickshaws to air rickshaws,” he said. Sinha also spelt out job creation potential of the aviation sector. He said that currently about 2 lakh people were directly employed in the civil aviation sector and about six times that number were employed in the linked businesses and those numbers will grow six times as the airports, planes and passenger trips multiply over the next 15 years. The government is setting up an aviation university and opening many new flying schools to build the skill sets, he said. Giving details of the expansion of the civil aviation sector, the minister informed that the Delhi international airport will a capacity of about 120 million passenger trips a year once its expansion is complete. He also said that work was starting on the Jewar airport in the NCR and that airport will also handle more than 100 million passenger trips. The aviation sector has achieved parity with railways in terms of both the volume of passenger trips and revenues, Sinha said. The total number of passenger trips on planes had reached 130 million last year, same as Indian Railways, and the total revenue of the national and the international airlines operating in India had reached about Rs 2 lakh crore, same as the railways. He said that with a growth rate of 15%-17% a year, the aviation sector will grow to 8-10 lakh crore in 15 years and it offered great business opportunities in the areas of airlines, airports, logistics, multi-modal connectivity etc. Speaking at the same event, Minister of Commerce and Industry, Suresh Prabhu said that India was set for a paradigm shift in growth following the fourth industrial revolution based on digitization, robotics and artificial intelligence. “With new ideas, technologies and startups coming in, India’s historic growth rate of 6-%-8% will not be a guide to the future growth rates,” he said. 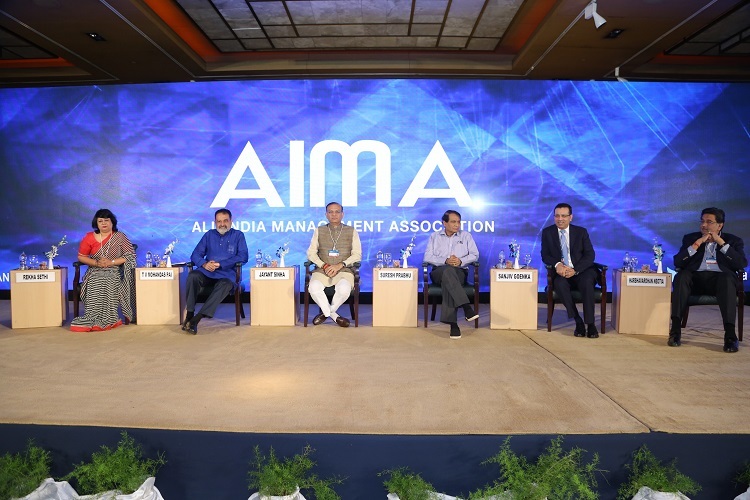 Prabhu and Sinha jointly released the AIMA – KPMG Report – Industry 4.0 – India Inc Gearing up for Change. The report claims that with supportive policies, the share of the industry in the GDP could rise from the present 17% to 25% by 2025. The industry minister said that the government was almost ready with the new industrial policy and that has addressed the issues thrown up by new technologies. He said that India was already the sixth-largest manufacturing country in the world and there was a need to mix the old with the new. “We must modernize the existing industry so that we do not lose what we have in the pursuit of the new, which is still a few years away,” he said. Prabhu said that the government had a clear vision that India should be a $5 trillion economy in five years and 20% of the that should be industrial GDP. “Going from $5 trillion to $10 trillion will take a lot less time because we would already have a larger base of industry and entrepreneur,” he said. AIMA presented the RK Swamy High Performance Brand Award for 2017 to Royal Enfield. The award is given to brands that not only enjoy high recall but also contribute substantially to the company’s topline and bottomline. The National Leadership Conclave is chaired by Sanjiv Goenka, Chairman, RP-Sanjiv Goenka Group. Mohandas Pai, President, All India Management Association and Chairman, Manipal Global Education Services also addressed the session with the ministers. The conclave included sessions with the Principal Economic Advisor to the Government of India, Sanjiv Sanyal; TechMahindra CEO and Managing Director, CP Gurnani and Brahamakumari Sister Shivani. The theme of the two-day conclave is ‘India Reimagined: Innovative, Inclusive, Invincible’.